The Axler QRA-501S Quick Release Assembly gives you the freedom to remove your camera from a tripod, stabilizer, or support rig without having to spend time unscrewing it from the device. It includes a quick release adapter and Manfrotto 501PL style sliding camera plate for smooth and easy camera positioning. The plate includes 1/4"-20 and 3/8"-16 camera screws for use with a variety of cameras, and features three built-in bubble levels to assist with leveling. 1/4"-20 and 3/8"-16 threaded holes on the underside of the adapter are provided for mounting to tripods, stabilizers, or other support rigs. Additionally, a 3/8"-16 screw and hex key are included which give you the flexibility to mount the adapter to any 3/8"-16 threaded hole. Box Dimensions (LxWxH) 8.268 x 4.173 x 0.945"
QRA-501S Quick Release Assembly is rated 4.6 out of 5 by 35. Rated 5 out of 5 by Corban from Great adapter! For about the same price as the manfrotto version, this Quick Relase as more bubble levels, more mount points, a very robust and well designed ratcheting plate lock, and most important for me, all of the controls on one side. This lets me attach and remove cameras with a more natural motion, even one handed. So far it's compatible with all of my manfrotto plates and hardware. Comes with a big and several small plate screws, as well as Allan keys for everything. I also use one between my Edelkrone slider and 100mm half bowl on my sticks, and it's solid as a rock, no slop or give even with a heavy rig on the slider. Rated 4 out of 5 by Tim B. from Very sturdy, bought 2 I use this to mount a camcorder (Sony HXR-NX100) to a monopod and tripod. I also have a Manfrotto QR on a Glidecam. The included plate works with the Manfrotto QR, by the way. I prefer this Axler to the Manfrotto, because the tighten knob is on the camera's left side (when standing behind the camera). This makes it much easier to reach, because the camcorder's grip is not in the way. Once locked in, the camera stays put. I routinely walk around with the monopod on my shoulder and the camera hanging off the end, with no worries. I don't find the bubble levels very useful, but they do add a nice bit of color to a boring black hunk of metal. My only gripe is that I'd prefer they offered this without a plate for a few bucks less. Rated 4 out of 5 by lionfilms from Good but be careful Ive brought a few of these over the last few months. I had an issue with one were the locking mechanics literally exploded, with springs popping out and lever falling down. I think it may have happened due to overuse, but nevertheless, I only had it 1 month. The other 2 Ive owned have worked fine. Rated 2 out of 5 by Kim from Better off with Manfrotto Biggest problem was the locking screw- it protrudes beyond the base, so it has to be over the edge of whatever you mount the baseplate to. Camera plate is one way, as opposed to 2 way like a Manfrotto- at least the older Manfrotto plates. Rated 5 out of 5 by Matthew from Great product This is a very simple, yet valuable product to have, thats why I bought 3. I own a good number of cameras and this helps me bring uniformity to my mountains solutions. I find that they work well as advertised and the price was very reasonable! Rated 5 out of 5 by Matias F. from Solid And built strong! I was surprised to find a product better than the original and at a better price. I was really impressed with this. I use it on my Ronin and it's perfect! Rated 5 out of 5 by Heraldo from Great tool for dslr videographers Exactly what we needed, use to attach camera to our redrock shoulder rig. Will this work on a Sachtler Ace L fluid head? 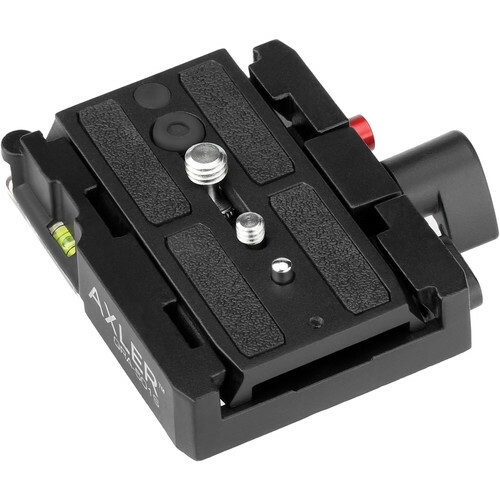 Ye, you can attach the entire QRA-501S to the Sachtler Ace L quick release plate. The plates however are not interchangeable. How about for Magnus VT-4000 tripod. Would the quick release plate fit on this system? No, sorry the Magnus quick release system does not work with any other. I have the Magnus VT-3000 tripod. Does the quick release plate for that tripod head fit in this? I'm afraid this will not work with the Magnus VT-3000, which has a proprietary QR Plate. The Axler product works with Manfrotto plates such as the 501PL and 501PLONG. can the plate be lifted straight up or does it have to slide out? This plate can only slide in and out; it cannot be lifted up. Will the Axler quick release work with the Benfro A38FDS2 monopod? No we are sorry but it will not. Please let me know if this adapter can be used with PROAM USA stabilizer? Hello, I use this with my Glidecam HD 2000 stabilizer and it works great. How many mm's does the locking screw protrude above the plane of the top surface of the plate (ie. in the z-axis) when it is pointing upwards? Now that I have the item, I'll answer it myself: it doesn't have to cross the plane of the top surface at all if desired . The screw can be pulled out (spring loaded) and adjusted to start and stop at different points. It only requires about a 1/3 rotation total to go from locked to unlocked, so you can position it to point downwards for unlocked and tighten clockwise stopping approximately horizontal to the top surface. However, it will have to either cross the plane of the bottom surface (13mm protrusion) or top surface (5mm protrusion). Does anyone know if this is compatible with the Benro S6 tripod head?